The Best Way to See Niagara Falls! The Cave of the Winds attraction on the American side is the greatest way to really feel the power of Niagara Falls and to see its beauty up close. You get as close as 20 feet to the water cascading down from hundreds of feet above! 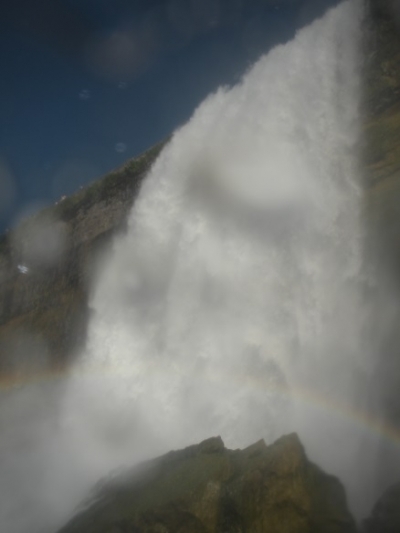 The strong winds push the mist from the falls everywhere, creating almost tropical-storm-like conditions that have to be felt to be believed. And the sounds of the water rushing by is louder than anywhere else on the Canadian or American sides of the falls. 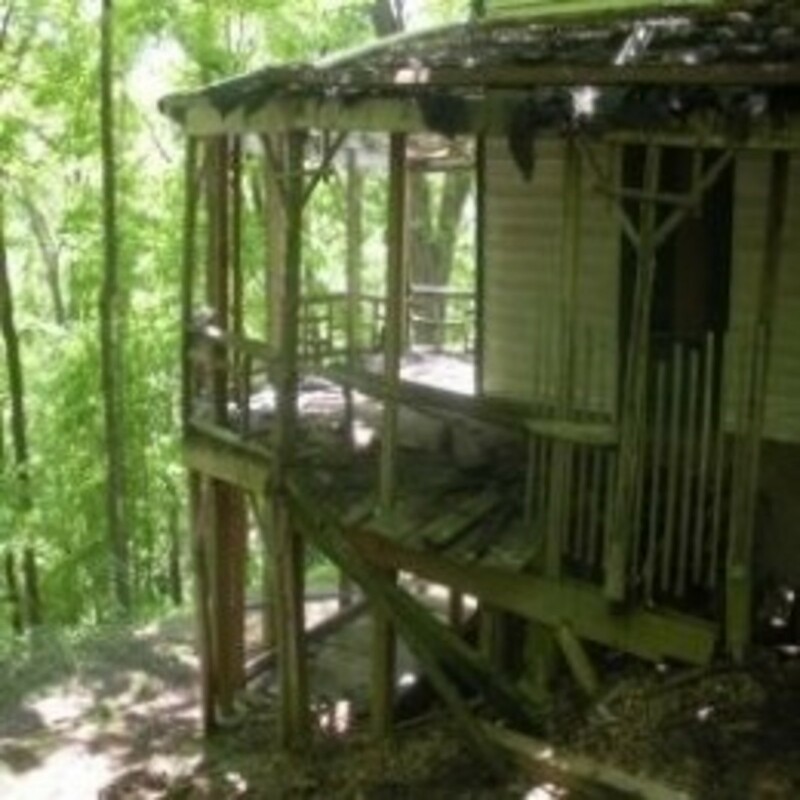 The photos in this review were taken by us during our visit unless otherwise noted. A History of the Cave of the Winds! Don't Expect to Actually See a Cave! The Cave of the Winds attraction is in the Niagara Gorge at the bottom of Goat Island, and at one time there really was an natural cave that could be explored. Located behind the Bridal Veil falls, it was an incredible 130 feet high and 100 feet wide. It was also about 30 feet deep. Tours of the cave began in 1841 and were stopped in 1920 because of dangerous conditions, according to local tourism information. The cave itself was destroyed in a 1954 rockfall and subsequent dynamiting. For more information on the history see here. 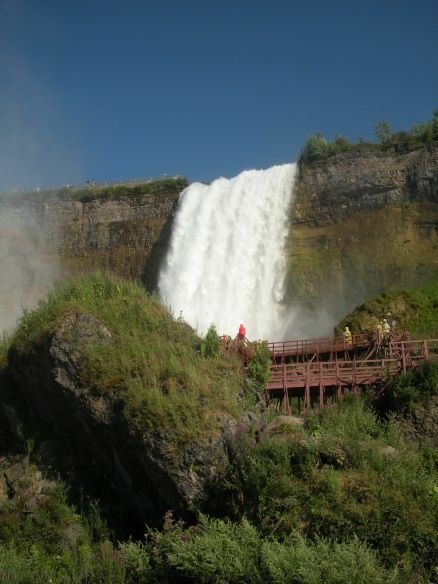 Today, visitors simply walk along wooden decks to the edge of the falls, which is plenty exciting enough! Goat Island can be reached from the U.S. mainland by car or over a pedestrian bridge. There is parking on the island, which cost $10 when we were there. The walk over the bridge isn't that long, and it's pretty cool to cross over the river and see it rushing below you. The sound is quite impressive as well. Once on Goat Island the entrance to the attraction is a stone building, and it is pretty easy to locate. With your admission charge you will receive a poncho and booties to help you stay dry. You will definitely need them! An elevator takes you down 175 feet into the gorge, where you are let out on the wooden walkways and decks that lead to the Bridal Veil Falls. This shot is from near the area where you get out of the elevator. To the left is the Canadian side of the river. 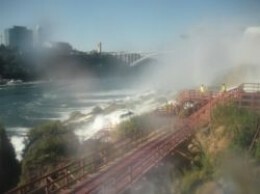 To the right, in the rear of the photo, is the observation tower on the other side of the American Falls. The tower is above the dock where the Maid of the Mist boat tours are located. Seeing the Falls From Different Angles. As you walk along the maze of wooden decks to reach the closest observation area you start to get hit by the mist from the falls. The decks get very wet! In fact, the decks take so much abuse that the attraction closes each winter and the wood is removed for safekeeping. In the spring the planks are wedged back into the rocks crevices without any other fastenings, so there's no damage to the nature below the attraction. In this photo you can see the youngest member of our family climbing toward the falls. He was about 10 years old at the time we visited, so that should give you some perspective on the scene. ...Getting as Close as Possible to the Pouring Water! The day we visited the winds were very strong -- so strong in fact that we had a hard time looking up at the falls because the water was hitting us so hard! Here is our son on the observation deck that is closest to the water. He got soaked, of course, even with the poncho on! The wind was strong enough that it wouldn't stay on his head, but let's be honest: No full-blooded 10-year-old boy would care about that! He wanted to get as wet as possible, and at one point even motioned to take off the poncho until his mother said no! You can spend as much time as you'd like on the decks of the Cave of the Winds attraction, and we were there for about 40 minutes. 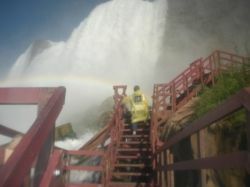 That's plenty of time to walk around and see the Falls from just about every angle possible on the attraction. There is a straight boardwalk to the observation deck for people in wheelchairs or those who don't want to climb along the stairways on the rocks, so everyone can enjoy the view. The ponchos and booties are souvenirs, although in truth they aren't the best quality. We have put the ponchos in the rear of the car for emergencies, but got rid of the booties once we took the elevator back to the top of the island. If you are planning on visiting Niagara Falls, you should go when this attraction is open because it was the most fun we had while there. 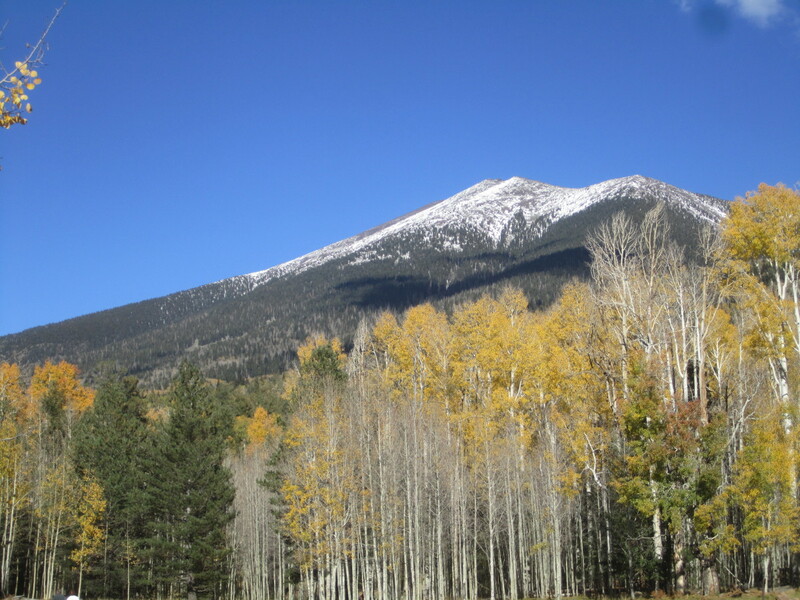 You can check to make sure it has reopened from its winter closure by contacting the park here. 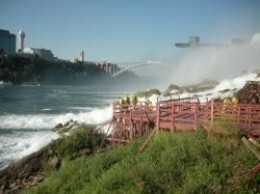 Will You Visit the Cave of the Winds... - If You Go to Niagara Falls? Will the Cave of the Winds be on Your Itinerary? It's Already On My List of Things to do There! Absolutely -- If I Ever Get to Niagara Falls! I've Already Been to the Cave of the Winds -- And Would Love to Go Again! Nah. I've Already Done it. No Sense in Repeating Myself! No, It Isn't My Cup of Tea! I Haven't Made Up My Mind! Here is the New York state park's webpage on the Cave of the Winds. This is the official website of the Niagara Falls area. This is the Wikipedia page about the Cave of the Winds attraction. Have You Ever Visited Niagara Falls? 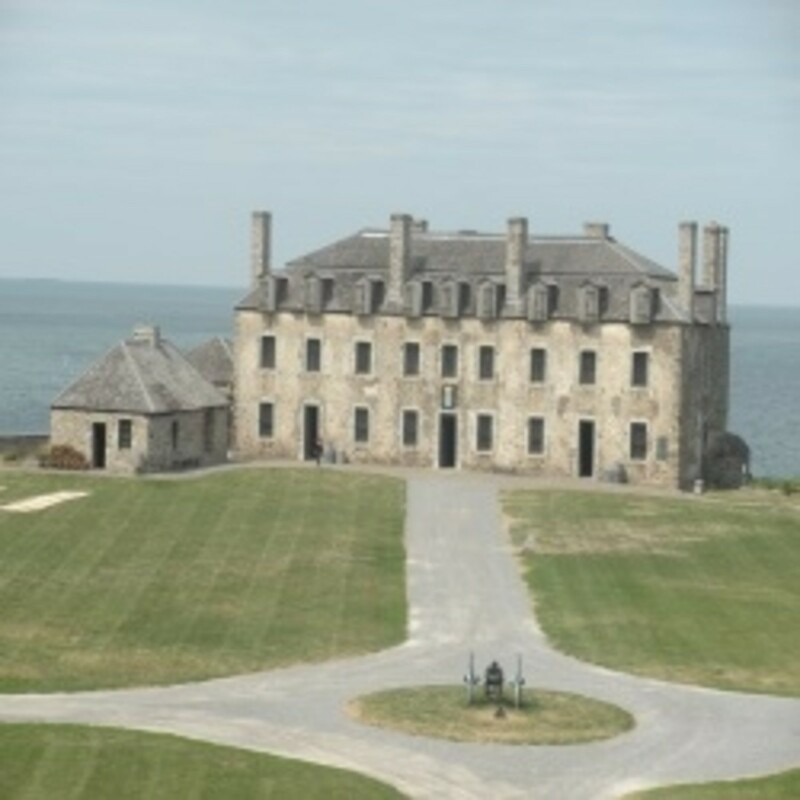 A short drive from Niagara Falls on the U.S. side is Old Fort Niagara, a national historic site that explains the strategic importance of the area before and during the founding of the United States. It may be hard to believe today, but the region was a front in several wars involving France, Britain and the U.S.
Nova Scotia and Montreal: Great Places for Vacations! - Articles to Help You Plan a Visit to Canada! Montreal's Biosphere: A Great Way to Learn to be Green! A Close-Up Of Our Son Enjoying Niagara Falls! Do Your Children Love to Get Wet? Of Course! All children do! 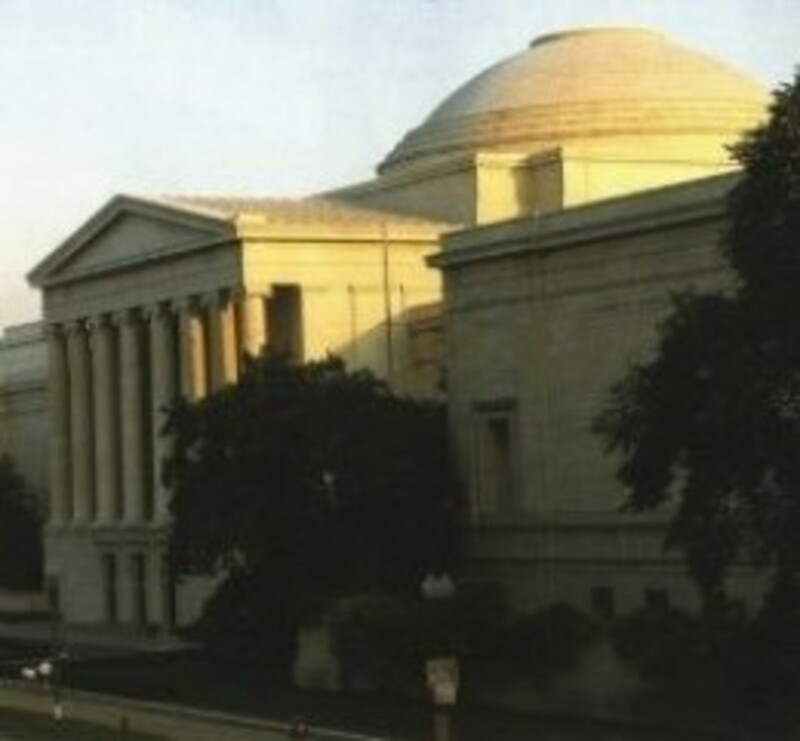 Valley Forge, Gettysburg, Thomas Edison's Lab and the Frick Collection! - Reviews of Pennsylvania/New Jersey/New York Sights to See! Ford's Theatre, National Portrait Gallery and the National Zoo! 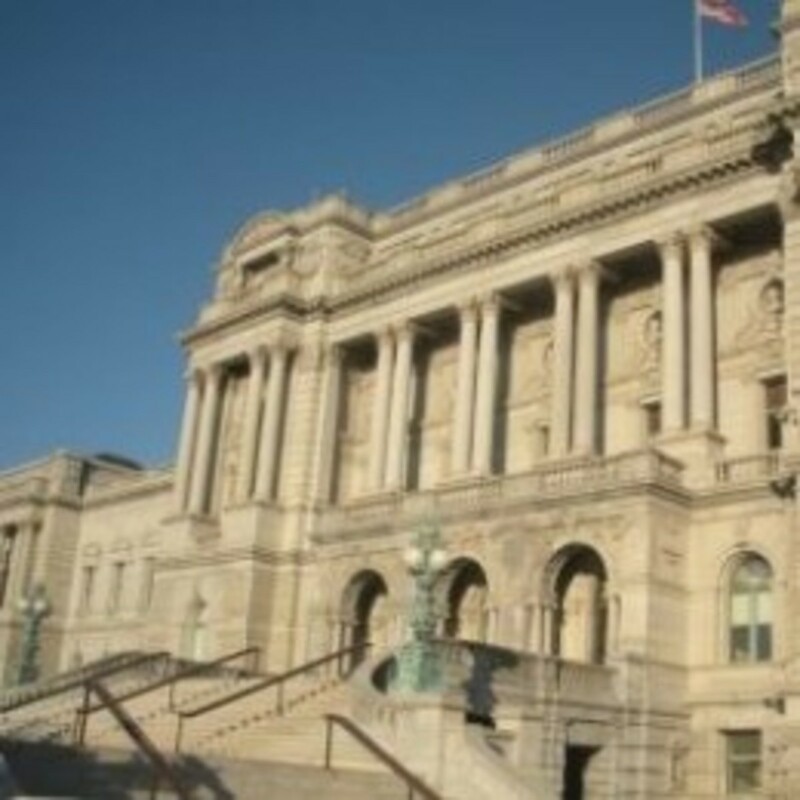 - Reviews of Places to Visit in Washington D.C.
Another Video of the Cave of the Winds! Fort McHenry and Geppi's Entertainment Museum! 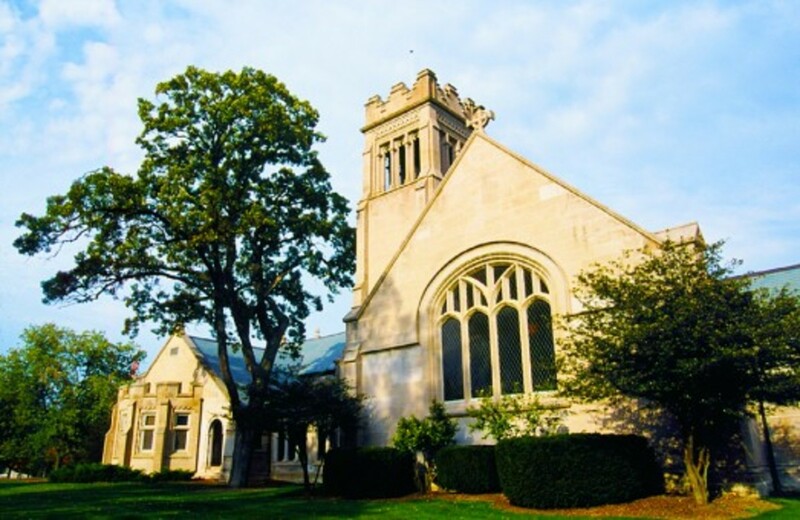 - Baltimore-Area Places to Visit! Another Shot of the Falls! Of Family Vacations and Comic Books! We hope you enjoyed reading this review as much as we enjoyed our travels and writing it. Now it's your turn! Now we could make this a overnight trip! Excellent lens and incredible photos! I've never been to Niagara Falls, but I've always wanted to. I had to read this article when I saw the title. 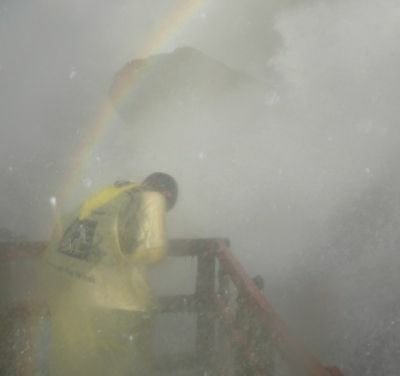 I'd watched an old black and white series which was filmed at Niagara Falls and part of it took place at cave of the winds. Great lens. I've been to Niagara Falls once, and did the tour that goes under the falls. That was fun (and plenty wet). We stayed on the Canadian side. I enjoyed your stories and photos very much! This place looks amazing. I wish I will be able to see it once. Your travel lenses are always spectacular. Thank you so much for this tour. I felt the wind and rain as well as I might reading any novel. Wow! That must be an amazing experience and even a bit frightening! This is a great documentary on the falls. I live in Australia and there is no way I could visit these falls so I thoroughly enjoyed your visit there. The pics and videos are amazing. Thanks and well done. I've been there on January 4 when it was 3 degrees outside and the falls were freezing over on their surface and they had them backlit at night. I'd like to come in the daytime sometime, and also again on a cold winter night -- both with my camera, of course. Your pictures are awesome! It was a delight to journey through your lens! It is such an awesome sight to see. What a great lens! Thanks for sharing it. Beautiful place! Nice job making this lens! I have been in Niagara Falls on the Canadian side only, although I did take the boat. I t was amazing. I think next time I go I will have to check The Cave of the Winds attraction on the American side. Niagara falls look great always and you make it look even better. Niagra Falls ... yes I saw it once many moons ago. One day I will go back and see it up closer - like the view from this Cave of the Winds. You have brought Niagara Falls to light in an entirely new way. Thank you. I'll need to revisit the Falls. I have visited Niagara Falls but it was a long time ago. We were there in the winter and the mist had all frozen on the branches of the trees. It was magnificent. Looked like a fairy land. Wow, the Cave of the Winds looks like it might be a bit scary, but it's really beautiful! We visited Niagara Falls as part of our honeymoon road trip to Quebec City. Unfortunately, we didn't have time to do the Cave of the Winds, but I am sure we will if we are blessed to return. We loved seeing the Falls. Thanks for your tour! We went to Niagra Falls on a family vacation when I was in 3rd grade. I do hope to have the opportunity to see if again. This looks interesting. 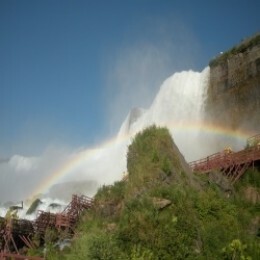 I've never been to the American side of the falls, but I might have to check this out if I wander over that direction. It's interesting that I could never figure out why Canada was always to the left of Niagara Falls, but now looking at the map, I see right away why that is. I have heard of so many people who enjoyed the Cave of the Winds. If I ever get back to that part of the country, it's on my list! Beautiful lens. Wonderful and congratulations on your purple star. 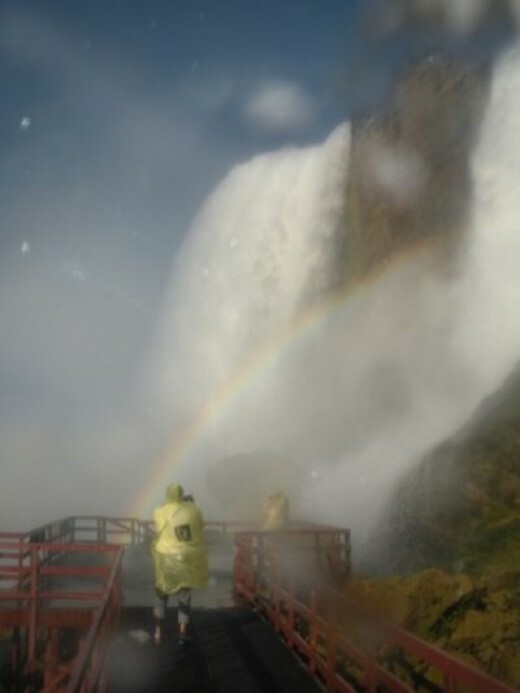 Wow, such a great lens on visiting the Niagara Falls. Thank you for sharing. What a great lens! Thank you for sharing! We plan to visit Niagara Falls in the next few months! Great photos of wonderful scenery! If I win the lotto they will be on my list to visit . Great lens!! 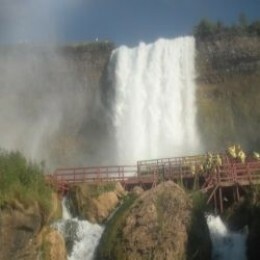 I've seen the falls once, six years ago, would love to go again. I love to visit Niagara falls again, it's been 15 years! Was not able to experience the Cave of the Winds though. I have never visited there, but hope to one day. I have been deprived that I have never been to Niagara Falls. Went there 3 years ago and your lens brought good memories. You told it like it is, thx. Your pictures are amazing, who doesn't want to go there? I must go there one day! This is a very interesting lens! 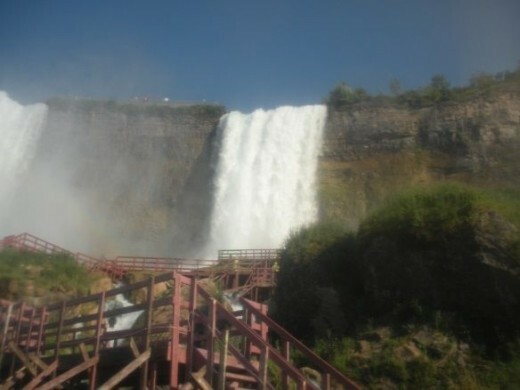 A trip to the Falls is in our future as we typically visit relatives in Ohio in the summer. Good to know that this is on the US side since it is such a hassle these days to cross the border. I grew up going to Niagara Falls! We lived in the Rochester, NY area and went at least once a month every summer -- parents, siblings, grandparents... we'd all pile in the cars and drive over with a picnic lunch, which we'd have on the American side of the Falls. Then we'd drive over to the Canadian side, which was always funny (to me) because my grandfather always had to show his passport to be allowed in because he was born in Canada and then immigrated to the United States. Took many visiting friends to the 'Cave of the Winds' over the years. Fun memories! I've been close enough to the falls to see the mist from them, but was not able to actually go see them - so would have loved to! I've been to the Falls once. Honestly, I thought it would be much larger. After seeing movies such as Niagara and Superman, I had this idea that it was the size of Rhode Island ! LOL It is a fun area to visit and the view is great. I definitely need to get to Niagara Falls at some point. Even more determined now I have read your lens on it. The cave of the winds looks like a must do experience. I'd love to go and see Niagara Falls. Now that I've read your beautiful lens must admit it would be fantastic to visit this place. @Lensmaster...Congrats on a well-deserved Purple Star for this gorgeous Lens! @Lensmaster...Beautiful shots of Niagara. I was there on a pre-wedding trip way back in 1972, and never will forget the awesome falls! I have wanted to see Niagara Falls for myself. You must be able to feel the power of the water that falls. Ahh, the power of Squidoo ... I had no idea that "the cave of the winds" existed(!). 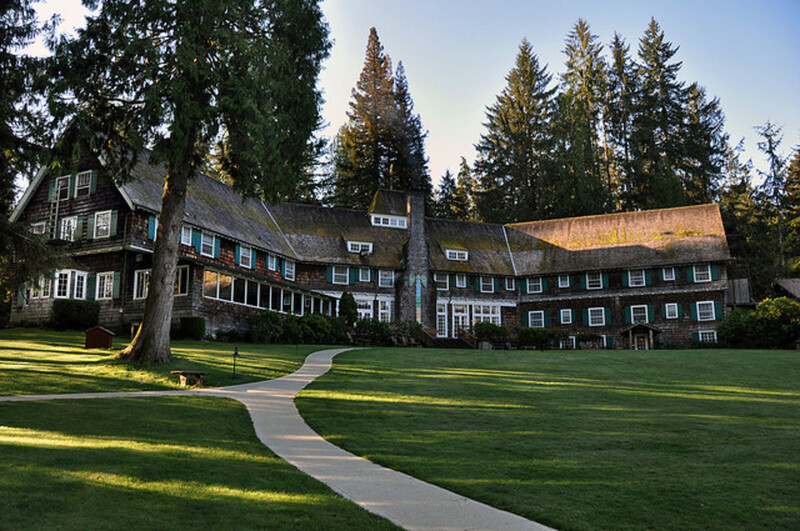 I've visited when I was young but would love to go again! Truly amazing! truly remarkable. Even from the picture, it looks to create a beautiful rainbow. Amazing. It looks awesome. I am on my way to upstate NY next month. May just have to travel up there too. I was at Niagara in January when the falls were freezing over (4 degrees that night!). I didn't make it below deck, though. Would like to go back and get the full experience sometime. Looks like an interesting trip. I'm visiting my sister in Canada later this year and we'll be going to Niagara Falls. She's lived there all these years and never been herself. I really wanted to go to Niagara Falls last year but just couldn't make it. I would definitely go see the Cave of the Winds. That looks like so much fun! Just imagining of being there thrill me. My Mom was born in North Tonawanda, nearby the falls, so we got to visit the falls many times, including when they turned off the American side to see what they could do about the rocks at the bottom. It's an amazing place. Thanks for the info, it sounds great. I plan to go to Niagara in the next few weeks. Will keep this attraction in mind. These are wonderful photos. I can feel the spray. I've never been to Niagra Falls (at least I don't recall...if I did go with my family, I would have been too young to remember). I'd love to go though! Thanks for the information, great lens! A wonderful read - thank you. Would love to visit Niagara. Amazing photos. Would love to visit Niagara one day. It must be a stunning feeling viewing it from a low vantage point. We've got a Cave of the Winds out here in Colorado by Pikes Peak. Never knew there was one at Niagara Falls. Nice lens. I have been to Niagara many times, but I don't remember the cave... :) Thanks for this interesting piece! I lived in Toronto for a few years during my childhood and visited the Falls at that time. Not sure I could get out on that wooden platform now though as it looks a teeny weeny bit scary! This look like such a fun trip.Thanks for sharing it with us. I hope to visit Niagara Falls someday. 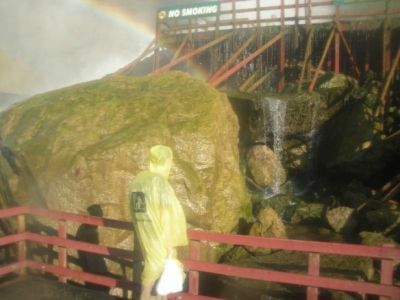 We took our kids to Cave of the Winds when they were small, and on that particular day I think the wind and/or water was harder than usual, and I felt that if I had let go of the hand of my youngest son, he would've been blown away at one point. That was scary, but the rest of that hike was interesting :-) Your photos here bring back mostly good memories of our visit! I live in the UK but I've been to Niagara Falls three times. I would go again any day if I found myself nearby. I drove down from Toronto when I was visiting. I've never been to the US side of the Falls though. I've never been to Niagara Falls, though it's on the (long!) list of places I'd love to see. 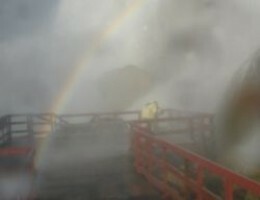 The Cave of the Winds looks magical, and I love your awesome rainbow shots! Thanks for sharing your vacation pictures and giving us a tour of the Cave of Niagara Falls! I loved the photo of your son getting drenched and your comment about it. So true!! My son is 12, and he would definitely want to get soaked to the skin doing this!